Getting jobs on Upwork is easy. Getting the top paying freelance jobs when faced with strong competition is difficult. Upwork system can sometimes resemble a race to the bottom of the pricing market. This frustrates and disheartens freelancers. No matter how low you bid, there’s always someone who will bid below your price. However, competing on price should NOT be your strategy. Let's take a look at how to use Upwork like a super user and make money like a boss. 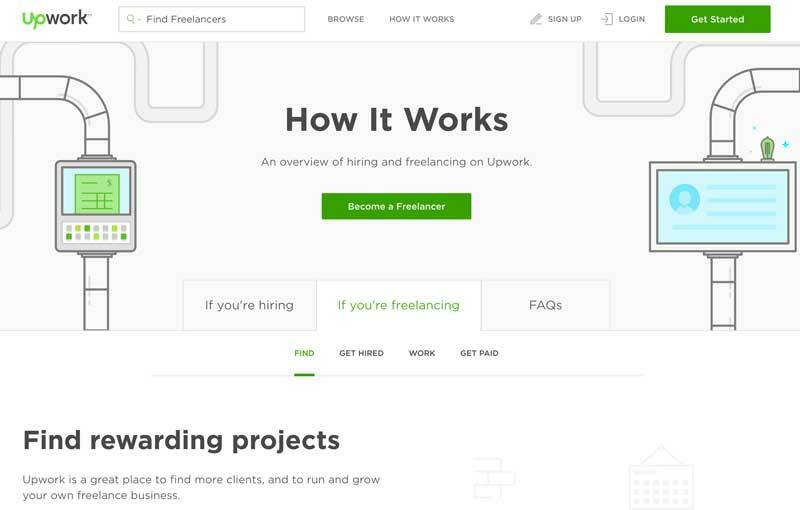 These Upwork tips are suitable for beginners and more experienced freelancers. Getting good projects from Upwork takes time, marketing chops, a little patience, and above all, skills. That last one is important. The best strategy in the world won’t help you in the long-term if you're not a skilled writer, coder, designer, or [fill in your niche]. Improve your skills and then ask for what you’re worth. This article will focus on finding freelance writing jobs for beginners. 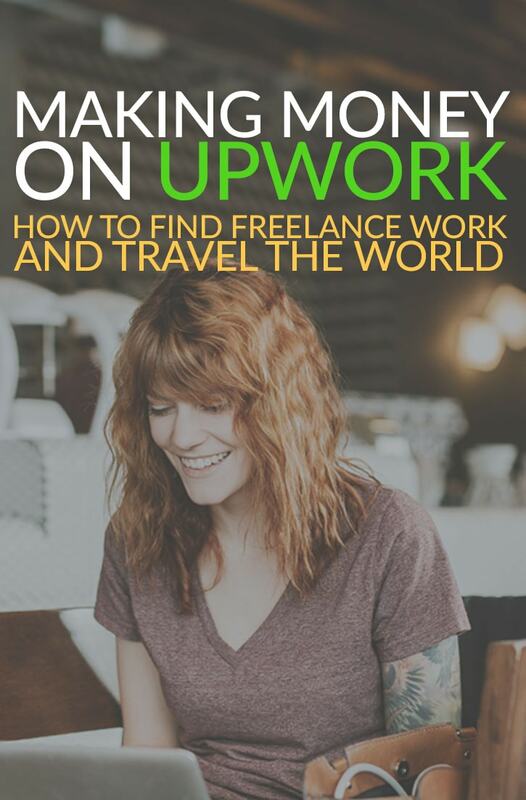 It will also help travel bloggers and Digital Nomads make money on Upwork to finance their travels. Coders, designers, and other types of freelancers will find the tactics and tips can be applied to their own situations, with some tweaks. Can you make a living on upwork? Absolutely. But you can also use it as a side gig or freelance model to see if it works for you. 2 Is Upwork Worth It? 8 Should You Take Upwork Tests? Both are valid ways of making money and living a location independent lifestyle. I'm a blogger and I travel the world. This is my travel blog which gives me a (very) small income every month. I also take freelance copywriting jobs and blog writing assignments on Upwork to pay the bills. Writing a travel blog is not a way to make money in the short-term, even more so for beginners. If you're just starting a travel blog, don't make financial decisions based on the future roaring success of your business. Apologies for the pessimistic tone but I want to be realistic about expectations. Every year blogging becomes even more of a long game. Making money from writing blog posts for your own sites is something to do on the side. In most cases travel blogging is not a good way of making money. I'm sure this statement will spark outrage but with millions of travel bloggers grinding out the 10 Best X in X over and over, competition is high. Writing great blog posts or travelling to interesting places will not propel you to superstar travel writer status by itself. The one thing that all travel bloggers agree on is that time is the most important factor. Luck, of course, trumps everything. Ignore the “Make money with your travel blog today” type Facebook ads and blog articles. You will not make money from a travel blog right away unless you're very lucky or very dedicated. A consistent effort for longs periods is what's needed to break into the travel writing niche. Sorry to break the news to you. But that doesn’t mean you can’t make money blogging while you travel. Upwork provides a platform for selling your skills to help maintain your location independent lifestyle. I used to hate everything about Upwork. I’ve used Upwork as a client for over 4 years. In that time I’ve dealt with lazy, and dishonest people many times. I’ve received crying letters from freelancers after I refused to pay for unacceptable work. I've wasted hours of my time and lots of money on projects that had no chance of success. When I began working as a freelancer the low rates and demanding clients killed my motivation. But I can’t blame the clients. I also used the site to find cheap work. I soon learned that that cheap, quick, and quality work are mutually exclusive. Good content creation does not come cheap. Complete your profile. 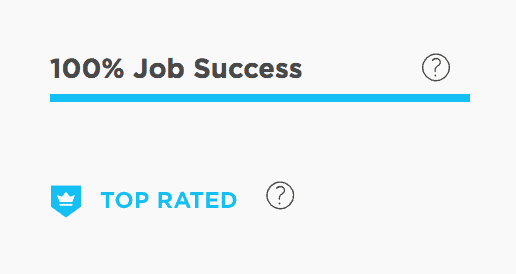 Make sure upwork gives you a 100% score for your profile completeness. This will help your profile appear in search results. The more eyeballs on your profile, the more chances of scoring work. Update the portfolio section. See How to get Clients when you Don’t Have Feedback on Upwork. Use your credits wisely. Blasting out proposals to every client that looks semi-promising will eat up your credits. Build relationships. Contact clients some time after completing a job to ask how the project went and if they need any more help. Sometimes a little reminder is all it takes. Deliver ahead of time. Anything you can do to impress clients with your speed and efficiency will make them remember you for the next time. Repeat clients are the best clients. Show them you deliver early and consistently. Ask for feedback. Sometimes clients forget or are too busy to leave feedback. Ask them politely to help you out if they were happy with your work. Work at least one job per month. This will keep your profile from changing to ‘private’ automatically. If you're busy, take a quick job that won't eat up too much time. Eliminate grammatical errors. As someone who makes most of their money from writing, I obsess over grammar and spelling. But despite running my writing through Prowriting Aid and Grammarly, errors sometimes remain. It’s hard to spot your own mistakes, especially if you’ve been working on something for some time. Have a friend or colleague (preferably someone who can write well) read your text before you publish. Many of the clients on Upwork are professional writers themselves who need help with their workload. That single spelling mistake on your profile or application will kill your chances of success. Take tests. But only if you can spare the time. If an Upwork user searches based on test scores you'll need to have taken a test to appear in the search results. See Should You Take Upwork Tests? Respond quickly to clients. Travel bloggers, lifestyle entrepreneurs and digital nomads move around a lot. Access to a decent working Internet connection can sometimes be hard to get. If you know you'll be out of reach for a while, let your current clients know in advance. Set your availability to reflect your ability to respond to job offers. If you’re heading to the jungles of Thailand for a week, make sure you set your Upwork profile to unavailable until your return. Upwork takes a fee of 20% for jobs of less than $500. Factor this 20% cut in revenue when sending a proposal. If you receive payments via PayPal, calculate the extra costs involved in transferring from PayPal to your bank account too. Once you find a client you like working with and that pays well, do everything you can to keep them. Client prospecting takes time and doesn’t create revenue. Customers that pay on time and provide reasonable expectations are worth spending extra time on. Think about the time you’d need to spend looking for a new job. If it takes an hour of your time to prospect for jobs and crawl through lousy offers, it's worth investing a half hour extra on your current client’s project. They will thank you for it. They might even give you a bonus. The other advantage of relying less on new clients is that you use up less Connects. Connects are like tokens that you use to contact potential clients. It's Upwork's way of reducing spam and it's also a way of charging you more money for the service. You've got limited Connects. Make the most of them because when you've exhausted your monthly quota you'll have to pay for the privilege of applying for more jobs. Charging higher fees is a way of ‘beating' the 20% cut that Upwork takes. For jobs priced over $500, the fee for the amount over this threshold is 10%. It's worth talking to your current clients and asking if they can bunch some upcoming jobs together into a single project. Instead of three separate jobs at $300 per job, one job at $900 will save you money. The fees on $400 of this amount are only 10%. Above $10,000 the fee drops again to 5%. Next, I set the Experience Level to Expert and the Minimum Budget to $100. This isn’t perfect as there are plenty of quick-win sub-$100 jobs I’d gladly work on. But it's hard to find them. 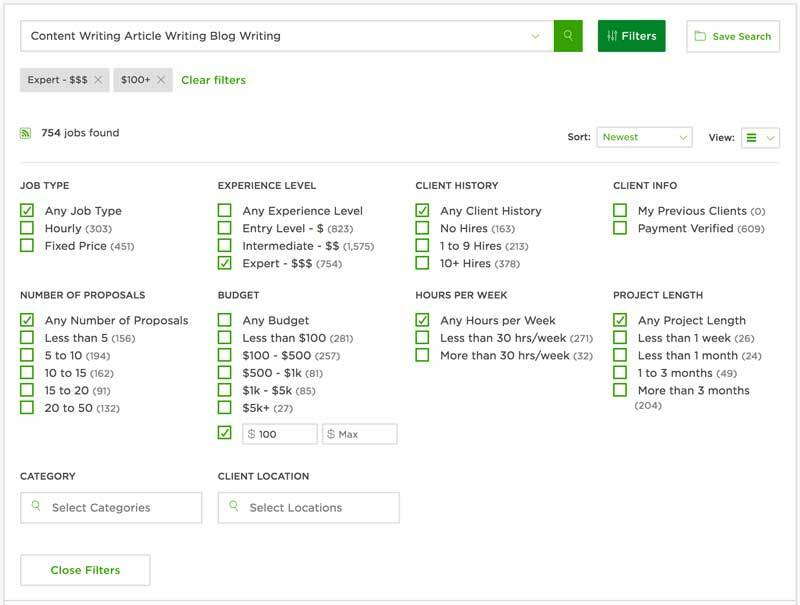 Many clients set the Experience Level to Expert, yet offer $5 for 1000 word articles. Don’t do these jobs! Ever. Even if you roll out low-quality content to save time, clients paying this low will ask for a rewrite, complain or refuse to pay. They're also more likely to give bad feedback. Avoid “$5 for 1000 word” clients. But you knew that already. Play with the Client History filter to find people who understand how the hiring on Upwork process works. Experienced Upwork clients will leave you alone to work. Inexperienced clients often need to be managed. The Client Location saves me a lot of time and stress. I don’t want to work with clients (or freelancers) from certain geographical locations. Personal experience has taught me that my life will be hell if I take their job offers. The work ethic is so different from mine that I always regret my decision. I’m not recommending you do this but I want to give my personal experience in case you encounter something similar. Create a portfolio of projects. The portfolio doesn't have to limit itself to one place on the internet. Write for free for friend’s blogs. Better still, write on your own blogs. Get your writing published on the Internet. Publishing content has been the most important step in client acquisition. Start a blog in the niche you understand and love. It doesn’t matter if the site doesn’t perform well. Ignore keywords if you must. The plan is to get your posts published and to show how well you can write. If you’re just starting out this is also great for honing your blog writing skills. It’s easy to think you’re a great writer when you’re jotting down notes on your computer or in a notebook. Publishing on the web means opening your work to the entire world. Do it often and do it well! Offer to write for free for a blog in a niche you'd like more work in. Be specific. Niche down and target a few areas. If that fails, write in whatever niche you can find but put try to put your own voice into the work. Don't make it look like a generic newspaper article. Writing about furniture (which I’ve done), for example, when you haven’t a clue about furniture (which I don’t) can be tiring and tedious. Clever writers learn how to put a new angle on the “buy my great product” sales pitch and make content more interesting. I always try to approach subjects I know nothing about in a new light. Try to use the experience you already have in another niche to create original content on the topic you’re writing about. But this should be an exception, rather than the rule. I can write 2000 words in an hour on topics I understand well and that doesn’t require lots of fact checking. I wrote the first 1200 words of this article in under 30 minutes. This doesn’t include rewriting, researching to add links, formatting, etc. But the hardest step is producing the first body of content. My advice is to write about things you’re interested in, and that you’ve already written about (or plan to write about). It makes the entire process much easier, requires less research, and the resulting content will help you find work on Upwork. If you know how to do keyword research, for example, then you have another marketable skill. Find a website in your niche. Find keywords that the site isn’t ranking for but has the potential to. Write the article around your target keyword and then contact the owner. Explain that you’ve done the research and written a traffic generating beast of a blog post for their website. All you ask for is that include your bio. You don’t even need a backlink at this stage (but that would be nice). What you need is proof that the article is your work. It might seem like a lot of work for nothing but believe me, your online portfolio is valuable. I’ve secured lots of jobs on Upwork by showing potential clients my portfolio projects. Hours spent crafting blog posts that bring me zero revenue are rewarded with jobs that bring in the money. You might think that this section is only for designers but the portfolio section is free-form so you can add whatever you like. Use pie charts and graphs to show how an investment in your writing skills can produce revenue for clients based on proven traffic numbers. Once you’ve reached over $1000 in sales and maintained a high rating level you will be eligible for Upwork’s Top Rated status. It comes down to delivering quality work on-time. Upwork may also list you as Rising Talent. Profiles with this title get viewed more often and are more likely to win projects. The Top Rated status gets you a badge on your profile (to show the world you’re a pro freelancer). This status gets you access to a forum for Top Rated freelancers on the platform. My favourite perk is the reduced fee for working with new clients. This applies for a single month but instead of paying 20% of your earnings to Upwork you pay only 10%. Once you’ve achieved a Top Rated status Upwork might invite you to the Premium Freelancer Program. It’s free so there’s no reason not to do it. Members of this program you get access to premium clients and projects. 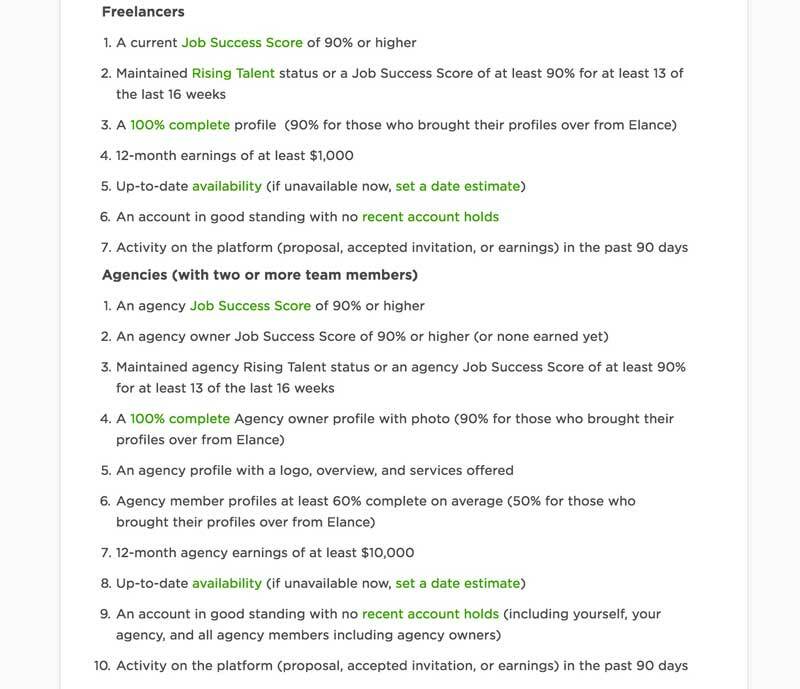 Your profile will get priority for Upwork Enterprise clients (the ones with the $$$ to spend). You also get access to talent agents who perform job research for you. They know the system and can send you work you might otherwise miss. To get on the Premium Freelancer Program you will need to do a skill assessment and have a Skype interview with the Upwork team. Should You Take Upwork Tests? My advice: Don't bother with tests. Put your time and effort into building a portfolio. I’ve spent more on Upwork as a client over the last 3-4 years than I’ve ever earned as a freelancer (1 year). I never look at the test results of any freelancer. On the flip side, no client has ever mentioned by test results. The fact is, freelancers can (and do) cheat on the tests. The test questions repeat every small number of test applicants. Upwork freelancers post questions and answers in online forums. You can find the answers to any Upwork question by Googling it. As a client, I ignore test results. I'm sure I'm not the only one. But, Clients can filter by test scores so it’s worth keeping this in mind. It could be worth taking the tests just for this reason alone. Tests take valuable time to complete so for me it’s a trade off. I went to the Upwork forums and asked if your test frequency and scores influence your profile’s position in the search results. In an answer reminiscent of every answer Google has ever given regarding their search engine, Upwork’s moderators replied: “While I won't be able to confirm these statements, it is advisable to provide as much information in your profile as possible about your skills and experience”. So that’s a “no” then. I’ve found through over 20 years working in fields as diverse as Tech, restaurant management, health & fitness, content marketing, and travel, that people like to work with people they like. 90% of my previous jobs came through word-of-mouth referrals, former clients, or acquaintances. If you’ve generated trust and goodwill with your client they are more likely to think of you for other projects. If you’re a likeable person and you feel confident talking to people you can use Skype to your advantage. Arrange a chat with the client on Skype and offer actionable advice for free. Help the customer as much as possible and be friendly but professional. Our instinct is to work with people we feel comfortable with. Skill sets often come secondary in the decision process. At your next cocktail party, Meetup, or networking event, bring business cards (yes, a physical one) with your Upwork profile URL. It looks professional even if it is just a piece of card. If people like what you have to say and feel comfortable dealing with you, your business card will be top of the pile when hiring time comes around. Your profile on Upwork will seal the deal. Rapport is very important. I spent many years in a (sometimes) high-stress environment dealing with very demanding and difficult customers. Learning how to turn an angry customer into a fan is a game I like to play. It helps business and it helps make your day a happier one. The same applies to freelancing. On Upwork it's even more important to placate dissatisfied clients. Negative feedback lowers your chances of getting work. There are countless reviews of the platform on sites like G2 Crowd, Trustpilot, Glassdoor and Indeed. The latter two are reviews by current and ex employees. You shouldn't include these in your criteria for selecting the platform as a place to freelance. You won't be working for Upwork. In fact, you are Upwork's client. Sites that review websites and software like G2 Crowd attract a fringe element of disgruntled workers. Know this: there are plenty of shady operators on Upwork. There are people that will work for almost nothing. There are bad clients and bad freelancers. My only issue with Upwork is that the administration portal is clunky and unintuitive. I won't blame the website for the people that use it. The low-hanging fruit (description, good profile photo, skill list) should be the first things you tackle. Filling out your own profile shouldn’t take too long and Upwork will keep pestering you to do it. Bite the bullet and get it done! Use the job title section to be specific about your skills. Travel Blogging Expert, for example, is a great title if your main skill is writing about travel. Blogger is less specific and will not be as helpful to potential clients. Make the overview as concise as possible. List your skills and explain why clients should hire you based on that skill. Adding “Creative Writing – My work has been published in the New Yorker” to the Overview will stand out far better than listing ‘creative writing' in a list of skills. Don't aim low. Setting your hourly rate to $10 will get you the worst types of clients. Low rates on your profile indicate a lack of professionalism and experience. The screenshot below is from the excellent IndieHackers website. 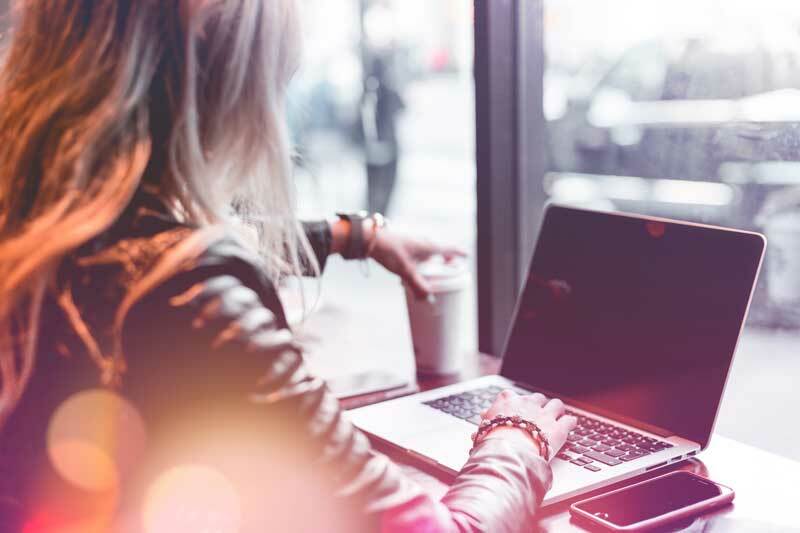 A discussion about hiring quality writers shows that clients view freelancers charging the highest rates as the most professional. 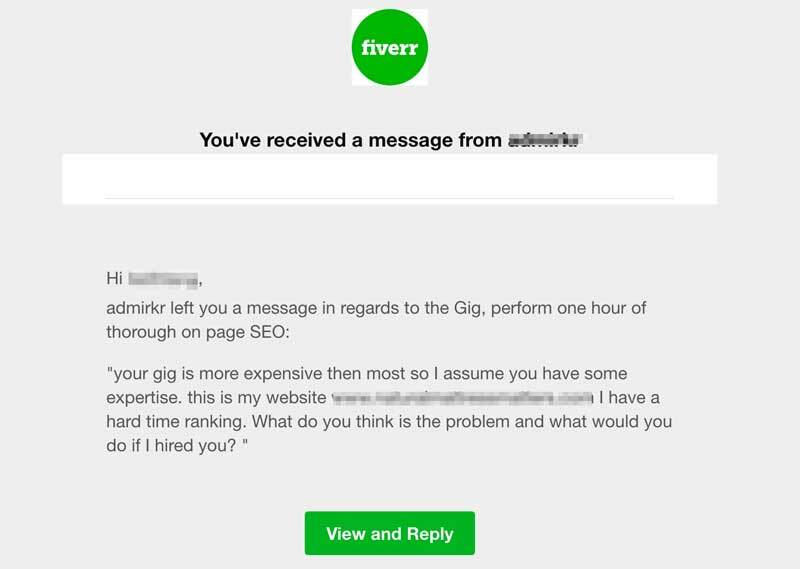 Another example is illustrated by the following message I received from another potential client on a Freelancing alternative to Upwork called Fiverr. By increasing my rates, clients accept that I'm an expert in my topic. By the way, my gigs on Fiverr are $5 and $60. I sell more of the latter. If you offer writing services in English you'd better set the English level to Fluent. For other types of work this is less important but clients, in particular, high-paying clients, don't want to waste time on communication issues. I travel regularly and have lived all over the world. For the past 3 years, I’ve been working freelance, building businesses and writing for my own blogs. Upwork has helped me find work to pay for travel, my own projects, and more. I have a like/dislike relationship with the platform but I can't deny that it been a part of my success as a lifestyle entrepreneur. 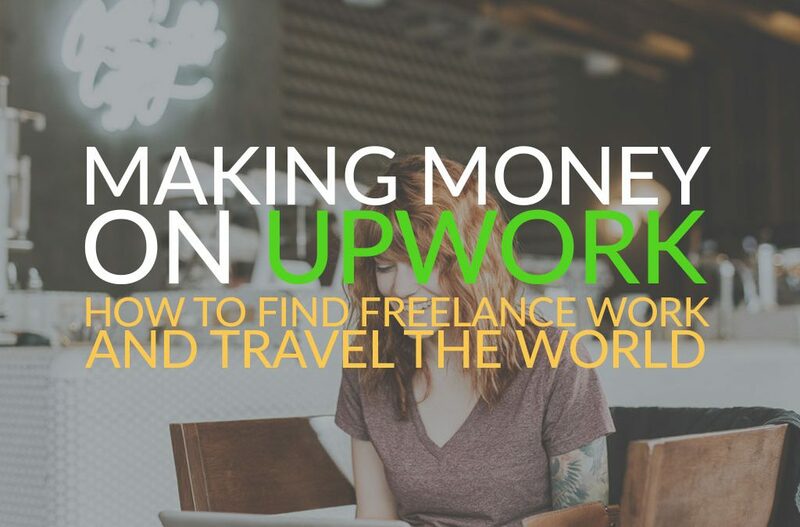 Making money on Upwork is a great way to start your location independent lifestyle.